In considering travel distances from Earth to neighboring planning consider the following. Intuitive "straight line" distance don't consider orbiting considerations nor necessary detours around the Sun. In spite of this, maximum straightline distances can be easily computed as shown in the table (just add one to distances from Sol, second column). This simple change does increase distance from Earth to Earth from from zero AU to two AUs. There might be a need for a spacecraft to fly to opposite side of Earth's orbit, perhaps a test flight or "shakedown cruise". Opposition: Mars and Sol are on opposite sides of Earth (Terra). Thus, Earthly observers easily see Mars. Conjunction: Mars hides behind the Sun (for Earth bound observers). Conjunction shows maximum straight line distance from Earth to Mars. 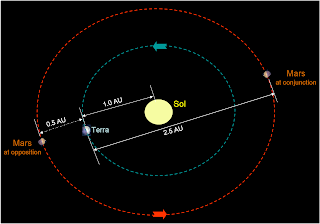 Thus, the conjunction distance to another planet is a good "typical" distance to approximate travel distance from Earth to a position on the far side of the other planet's orbit. Table adds a column to describe travel time of a photon traveling at c, speed of light, during maximum distance to Earth. Purpose is mainly academic as it puts an lower limit on travel time; this is the absolute quickest time anything (even electronic communications) can travel those distances. Determining number of seconds required for photon to travel from Sun to Earth is very simple. Recall that c = 300,000 km/sec , and AU = 150,000,000 km. Since time = distance/velocity = t = d/v, photon travel time = AU/c = 500 sec for one AU. Since all the Max Dist's are expressed in AUs, they can all be converted to "light seconds" (ls) by simply multiplying by 500. However, this method will quickly produce very large, cumbersome numbers of ls. A more convenient number would be "light hours" (lh), distance traveled by light in one hour. This conversion is easily done. Recall that 1 hr = 60 min * 60 sec/min = 3600 sec. Thus, dividing number of ls by 3600 will give us lh's for all the max dist's. For all practical purposes, this upper limit on speed, c, (or lower limit on travel time, distance divided by light speed, c) is unachieveable except for electronic communication signals. Perhaps we can find a more useful purpose for these values. Signal travel is limited by speed of light. Let's assume an interplanetary traveler is using radio waves to maintain constant contact with his/her colleagues on Earth. In practice, Terran sponsors want a constant flow of data from their expensive enterprise vessel; on the other hand, the traveler wants a constant flow of data from Earth for various reasons: guidance, security, entertainment, news, views, etc. Thus, a vessel would likely have a constant flow of two way traffic. However, these two flows of information would likely be independent; actual communication would have to undergo significant delays as shown by following example. Assume Interplanetary Traveler (IT) to be somewhere between the orbits of Jupiter and Saturn such that light has to travel an hour to reach Earth. (If 1 AU takes 500 seconds for light to travel, then 3600/500 AU = 7.2 AU would take light a full hour.) Next, assume IT wants to conduct a quick test of the communication system by sending "1234567890 THE QUICK BROWN FOX JUMPED OVER THE LAZY DOG'S BACK. ACK" First part is known as Quick Brown Fox (QBF) used in the early days of teletype (when all caps, upper case, was the norm for then expensive global communications) to test most characters. ACK just means acknowledge receipt by sending immediate reply. Thus, we can further assume zero processing time by the receivers on Earth. Of course, this results in a total communications delay of one hour to Earth and another hour from Earch for a total of two hours. We obviously picked 7.2 AU distance to make this thought problem more convenient. Point being, any delay over a few seconds will quickly surpass a typical human threshold for patience. Certainly any delay over a few minutes will undoubtedly do this. Today's space missions travel much slower and they encounter this problem. Accelerating at g will quickly achieve sufficient distance to create noticeable and then unbearably comm delay; thus, interactive communications between Earth and space travelers will quickly cease to be possible, mandating considerable autonomy to the space vessel occupants as well as necessary authority to the vessel's "captain". On the spot interactivity will become an artifact of terrestrial presence as stark distances will greatly prolong times of electronic signals between communicators. Thus, current email practices will quickly become the norm because noone will have the time not to mention the patience to wait for replies. Audio and video messages will be in the constant stream of data from Earth, but immediate responses (not to mention conferences) won't happen because simple physics prevent it. Thus, circumstances will force onboard crews to become much more autonomous; the ship's captain will really be in charge. 40 AU 40 AU range puts us within Kuiper Belt with lots of resources (asteroids for building materials; comets for fuel). Formula, 4√(d/g), approximates time for two way trip. Recall that g-force acceleration for d/2 (= 20 AU) will take √(d/g) (= 8.94 days). Double this to complete the 1 way trip takes 17.9 days; double again to include return trip: 35.8 days. Percent Take Off Gross Weight is portion of ship's original mass required for fuel. Accelerated particles double in mass when they reach .866 light speed. Thus, only one sixth of a percent of ship's mass is needed to maintain g-force. After about 36 days of g-force flight, only 6% of ship's mass needs to convert to kinetic energy (assuming 100% efficiency).